The success of Tadlow Music’s earlier album celebrating Jerry Goldsmith’s music for the TV series Thriller has prompted a sequel, and once again producer James Fitzpatrick turned to me for notes — another fun opportunity to provide musical and historical perspective to a major early credit in the composer’s filmography. 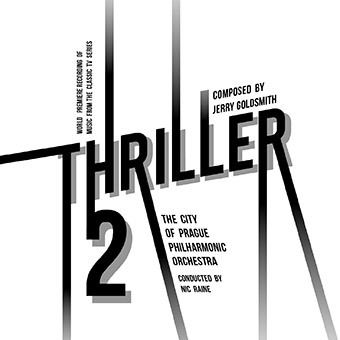 This album (superbly reconstructed by orchestrator Leigh Phillips) includes another six scores from the 1960-62 series hosted by Boris Karloff, including one of my favorite scores (“God Grante That She Lye Stille”) and two that employ surprisingly modernist piano techniques for TV scores of that era (“Late Date,” “The Terror in Teakwood”). This entry was posted in Composers, Television Music and tagged James Fitzpatrick, Jerry Goldsmith, Leigh Phillips, Tadlow Music, Thriller, Thriller 2 on April 17, 2018 by Jon Burlingame. From 1960 to 1962, horror-movie legend Boris Karloff hosted an hour-long anthology of tales of terror titled Thriller, produced by Revue (later Universal Television) and aired on NBC. Jazz great Pete Rugolo scored many of the first-season episodes and even released a wonderful LP of those themes in 1961. When a change in producers led to a fresh musical approach, Jerry Goldsmith succeeded Rugolo, composing 16 remarkable scores for some of the best, and scariest, episodes — a worthy followup project to his classic Twilight Zone scores for CBS. Producer James Fitzpatrick supervised a reconstruction and re-recording of six of these, and the result is a Thriller album of classic Goldsmith. I was pleased to recount Jerry’s history with the series — along with considerable musical detail about the scores — in a 2,200-word essay for the booklet (printed in glorious, and appropriate, black-and-white). 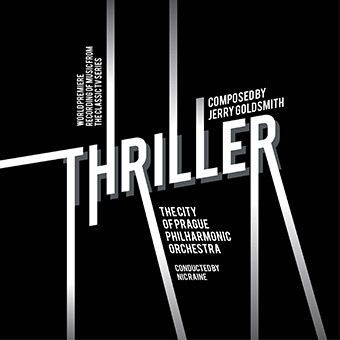 This entry was posted in Composers, Interviews, Television Music and tagged City of Prague Philharmonic, James Fitzpatrick, Jerry Goldsmith, Tadlow Music, Thriller on May 15, 2017 by Jon Burlingame.